Diane Clancy works closely with individuals to create web sites that express their vision. Diane will work together with you to design your web site to represent your work or yourself. If you wish, Diane's images may also enhance your web site. 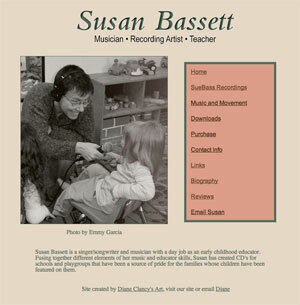 Susan continues, "I really have enjoyed working with you and I love my site!" Thomas Williams says, "Diane and Susan helped us design a web-presence that more than communicated our vision; its sincerity and simplicity lent credibility to our cause." Pam Roberts says, "I enjoyed working with Diane as she shepherded me onto the wide world of the web. She was kind, gentle and knowledgeable; she understood what I wanted and she did it quickly and effortlessly. After our meeting she made herself available by phone for questions and assistance as I made my first steps into blog-land." "I was amazed at how easy and inexpensive it was to get a webpage and blog. Working with Diane is blog-a-licious!" Pam continues. Diane Clancy's specialty is implementing your creative ideas. Diane hopes you will consider using her as your web designer. Diane Clancy would be delighted to talk with you at 413.773.7333.